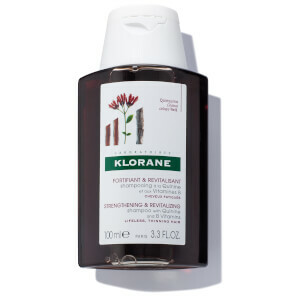 Strengthen your hair with the Klorane Keratin Strength Fortifying Spray with Keratin, Quinine, Caffeine and B Vitamins. Specially developed to treat thinning hair caused by stress, fatigue, nutritional imbalances and post-pregnancy, the vegan hair product takes inspiration from the latest methods of micro-nutrition, a scientifically-proven approach to target deficiencies by providing essential nutrients to the core of the hair fiber. Promoting stronger, healthier-looking hair, the leave-in treatment utilizes a Quinine Caffeine Complex to revitalize and tone the scalp, while a blend of Vitamins B3, B5, B6 and Biotin enhance hair strength. Strengthening from root to tip, the spray also contains plant-based Keratin, an ingredient rich in amino acids similar to those that make up hair's natural Keratin; it fills in damaged strands to leave hair looking denser and visibly healthier. Safe for use while breastfeeding. Housed in eco-friendly packaging. 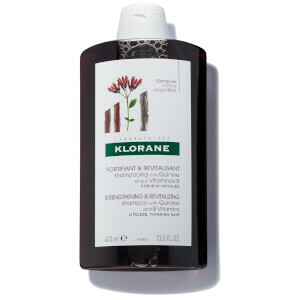 Free from parabens and sulfates. Vegan. Apply to towel-dried hair: 6-8 sprays over the entire scalp, 2-3 sprays on the hair. Gently massage scalp. Style as desired. Use 2-3 times per week.